These PDW Full Metal Fenders (that's the last time I'll be using that word) look good and perform well, and you can fit them to a bike without eyelets too. Six months in they're still looking good, too. Full Metal refers to the main part of the mudguard being extruded Aluminium, as opposed to the more usual plastic or plastic-metal construction. Aluminium can corrode, of course, which means it's important that it's treated thoroughly. I've had no issues with any corrosion on my pair, in spite of some rough conditions during testing. The Full Metals have a single stay (aluminium again) with steel bridge mounts to fit under a calliper brake. Or over, in the case of the rear one: although the mudguard goes under the brake as normal the mount loops over the top. Fitting the 'guards is easy and the stays are telescopic at the end, held in place with a grub screw. I was worried this wouldn't be a very secure way of getting the right length but I've had no issues. The Full Metals come with pressed steel plates that attach to your quick releases, with a mounting hole for the 'guards, meaning that you can fit them to bikes without eyelets. They're one of only a few 'proper' mudguard sets that offer this as an option. The mounting kit feels a bit cheap compared to the rest of the mudguard but it does the job fine. You'll need clearance between you brake calliper and your tyre, of course, but for most bikes this won't be a problem. In lieu of a bottom bolt mount at the rear the Full Metals use a mounting block held in place with an O-ring. Again this works fine, and means you don't need a chainstay bridge mounting hole either. In use these guards are sturdy with the fairly deep profile and long arc catching a good amount of spray. It would be good if longer spray flaps were included, or at least available, but you can easily knock one up if you need it. Despite being primarily metal they're not rattly at all, the only exception being the PDW button on the front mudguard which worked loose. A dab of Araldite sorted that though. I haven't had to use the emergency quick release function in anger (the mount pops to stop a caught stone catapulting you over the bars) but I've checked it and it works fine, albeit with a bit more force needed than, say, an SKS one. The Full Metals are designed to be used with a 23mm tyre according to PDW but there's plenty of room for a 25 in there. Even a 28 fits, just. Look good, sturdy, keep you pretty dry. Flaps could be longer, rear mount is unnecessarily fiddly. Ive actually been searching high and low for a set like on this bike http://farm3.static.flickr.com/2118/2335974777_013d932b6b.jpg any suggestions? Considering a pair of these for my winter bike - been looking for a neat set of alloy guards that are lowish profile but offer good coverage, and these seem to fit the bill. i don't think there's an alternative to the over-the-back-brake mount supplied, no. an SKS one could probably be persuaded to fit. Just fitted these today so not been out to test them yet. They were simple and easy to fit. I think they look as good as full length guards can. Feel sturdy and they really are low profile. I have been using these since Feb 13 on my Merida road bike and no issues, they fit well and look good to boot. I just got some of these for a Spesh Roubaix, they took me several hours to set up, I wasn't rushing though, but I can't even get a 24 mm tyre on the back without rubbing let alone a 25 mm or a 28 mm tyre, I think that is wishful thinking for most bikes because the Roubaix has more clearance than most. The rear rattles like buggery where the guard hits the brake bridge area. I put a tiny foam pad there which should solve that issue but of course it made the rubbing even worse. I have now put a 23 mm on the back and that seems ok but I haven't been out on it yet. I was using cruds before and they give more coverage on the seat tube and bottom bracket area so they keep the bike cleaner and they are much lighter and cheaper but not as neat.These do look good and they are sturdy so without rattle and rub (hopefully) I should be happy with them. The front one doesn't seem to rattle and works well with a 23 mm tyre, I tried it with a 24 but there is very slight rub. Another thing to watch for is the stay bolts came loose on one of my rides and I had to come home because they take a tiny allen key that you don't normally find on multi-tools, so they need checking and doing up tight but I carry the tool now. Also, you have to remove the QR fully to get the wheels off, obviously, and spare hardware is available for about 15 quid if you lose anything. These guards are an expensive option but posiibly worth it, at least with 23 mm tyres. Anybody know who the importer is for these? I am after the over brake mount not the full guards whech they sell as a separate kit. Currently using lightly modified SKS guards with the normal style mounting bracket on my CAAD8. I just need an extra fag papers width of clearance on the back wheel to run a 28 mm with no rub which this mount bracket might provide. You can get the mount in the PDW full metal fenders hardware pack, vanillabikes seem to be the cheapest. I have them on a Kinesis GF-Ti with 25mm tyres. Less faff fitting them than SKS. Though clearance is fairly tight, once they were set up they're pretty solid and I've had no problem with rubbing. Quieter than SKS as well and classier-looking. Fitted these on Friday and when they're not rattling they're rubbing, and when they're not rubbing they're rattling. Any tips from users on how to stop either?! 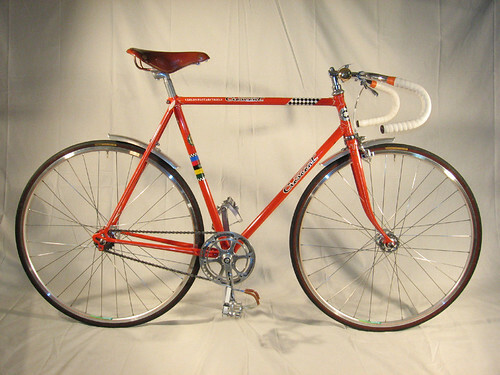 They're fitted to an Allez e5 SL and are soon to go up for sale. If they're rubbing then they need adjusting so they don't. Admittedly the allen screws to adjust them are tiny and on the underside of the stays which I found a PITA but I had mine fitted rattle and rub free quite easy. What size tyre are they going over? I fitted mine over 25c on a single speed with no problems even allowing for the rear wheel to move backwards for removal. You need to fit them so they're not being pulled in different directions. It took me a little time to get them right, but they're great when they are. The front should go on without a problem, it's the rear which may need tweaking. The rear needs to sit happily so it can be banded to the seat tube yet be clamped at the brake bridge. You may need some layers of tape as padding for it not to rattle against the brake or stay bridge. It still needs to be equidistant from the tyre at the back. The seat band works best with a bit of insulation tape padding, which also serves to protect your frame from rubbing. If you have a bolt hole on the chain stay bridge, some users drill the 'guard and attach it there, which negates the use of the seat tube band (sometimes the brake bridge too) and cuts that potential rattle out. Pics would obvs help too. I'm on 23 Conti 4 Seasons in terms of my tyres and I think I've located the rubbing - it appears to be comng from the section between rear brake & back of the seat tube. I may need a stronger o-ring than the one supplied though as it's a bit rubbish and doesn't appear to hold that section of guard far enough away from the tyre. The front one is perfect without any issues! Very rock solid. I think I had two o-rings supplied with mine? I misplaced the one that fitted while away, and used electrical tape instead, wrapping around the seat tube first to minimise rubbing, then looping it around the hooks like a piece of string. Worked well for several months, stopped it rattling against the front mech band, and the tape even matched the frame. The front is great - I have a small frame and toe overlap is an issue with my big feet. I've never managed to get any other 'guards to fit properly - any oversize ones which don't hug the wheel are downright dangerous. I've caught the front a few times but it fits so well, it's never been a problem. Tyres are 4000s II in 25c - they just about fit, even though PDW say that 23 is the max. A friend tried to squeeze 28s on but managed to trash his instead. Expensive mistake. Yeah, there were 2 o-rings in the box of gubbins. I just think that even the smaller of the 2 isn't tight enough as there's a massive gap between guard & seat tube. I don't think it helps positioning if you're using a band-on front mech like I am. Might give an elastic band a go!